Sanjaya said: Thus have I heard the conversation of two great souls, Krishna and Arjuna. And so wonderful is that message that my hair is standing on end. 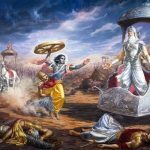 In the beginning of Bhagavad-gita, Dhritarashtra inquired from his secretary Sanjaya, “What happened on the Battlefield of Kurukshetra?” The entire study was related to the heart of Sanjaya by the grace of his spiritual master, Vyasa. He thus explained the theme of the battlefield. 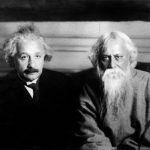 The conversation was wonderful because such an important conversation between two great souls had never taken place before and would not take place again. 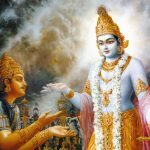 It was wonderful because the Supreme Personality of Godhead was speaking about Himself and His energies to the living entity, Arjuna, a great devotee of the Lord. 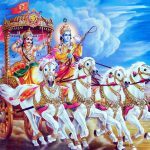 If we follow in the footsteps of Arjuna to understand Krishna, then our life will be happy and successful. Sanjaya realized this, and as he began to understand it, he related the conversation to Dhritarashtra. Now it is concluded that wherever there is Krishna and Arjuna, there is victory. 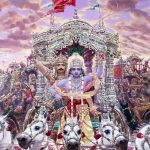 18.74 Sanjaya said — Thus, in this way have I been hearing, this wondrous and thrilling dialogue, as it took place between Vasudeva, the son of Vasudeva, and His paternal aunt’s son Arjuna, who is a Mahatman, one possessed of a great intelligence, and who has resorted to the feet of Sri Krsna. 18.74 Aham, I; iti, thus; asrausam, heard; imam, this; samvadam, conversation, as has been narrated; vasudevasya, of Vasudeva; and mahatmanah, parthasya, of the great-soulded Partha; which is adbhutam, unique, extremely wonderful; and roma-harsanam, makes one’s hair stand on end. sañjayaḥ uvāca — Sañjaya said; iti — thus; aham — I; vāsudevasya — of Kṛṣṇa; pārthasya — and Arjuna; ca — also; mahā-ātmanaḥ — of the great soul; saḿvādam — discussion; imam — this; aśrauṣam — have heard; adbhutam — wonderful; roma-harṣaṇam — making the hair stand on end.